You'll be £14.99 closer to your next £10.00 credit when you purchase Visitors' Historic Britain: West Sussex. What's this? Order within the next 3 hours, 1 minute to get your order processed the next working day! Many writers have written about the delights of the former kingdom of the South Saxons, its Downs, villages, countryside, people and their ways but Visitors' Historic Britain - West Sussex is the first book to take readers on a tour of discovery of each of the county's historic eras in turn. Starting with prehistoric Sussex, we explore West Sussex from west to east, investigating both little-known and well-visited sites that tell the story of our ancestors' past. We encounter wild warriors, formidable founders of the county, indefatigable industrialists, excitable eccentrics and the lives of Sussex inhabitants and invaders. Sussex is a country celebrated by writers, painters, royalty, artists and the millions who have enjoyed its changing coastline and verdant villages. Visitors' Historic Britain provides a unique series of journeys for those who are inquisitive about this quirky and history-changing part of the South-East. Anyone wishing to mug up on the county’s rich history need look no further. 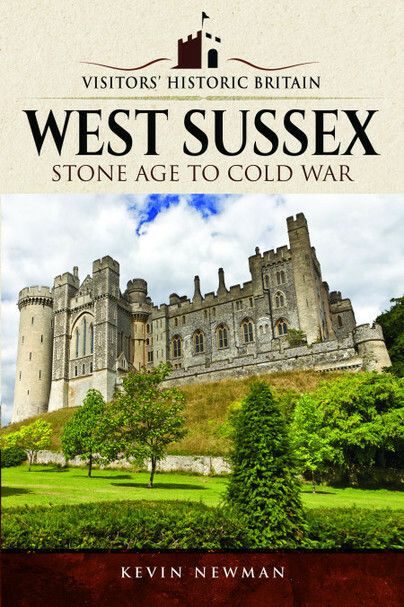 Local historian Kevin Newman focuses on the west of the county (another on East Sussex follows shortly) and has helpfully carved its back story into 12 bite-sized chunks – from prehistoric times right through to the Cold War. Kevin Newman is a Sussex-born and dwelling author, tour guide, teacher, history consultant, journalist and historian. He has written school textbooks, for Sussex publications such as the Argus and Brighton and Hove Independent as well a range of books on Sussex. Visitors' Historic Sussex - West Sussex is his first book for Pen and Sword and will be followed by a sequel on East Sussex and Brighton and Hove. When not engaging people of all ages with the past, he escapes up on the South Downs on walks much shorter than Belloc managed.